AMMONNEWS - Foreign Ministers of Saudi Arabia, Bahrain, UAE, Egypt, Kuwait as well as Jordan concluded their consultative meeting held Thursday at the shores of the Dead Sea. During their few-hour meeting, the ministers tackled common issues, regional developments and means of addressing them. Meanwhile, His Majesty King Abdullah II, late Wednesday, met with Saudi Minister of State for Foreign Affairs Adel Al Jubeir, Kuwait’s First Deputy Prime Minister and Foreign Minister Sheikh Sabah Al Khalid Al Hamad Al Sabah, UAE’s Minister of Foreign Affairs and International Cooperation Sheikh Abdullah Bin Zayed Al Nahyan, Bahraini Foreign Minister Khalid Bin Ahmed Al Khalifa, and Egyptian Minister of Foreign Affairs Sameh Shoukry. 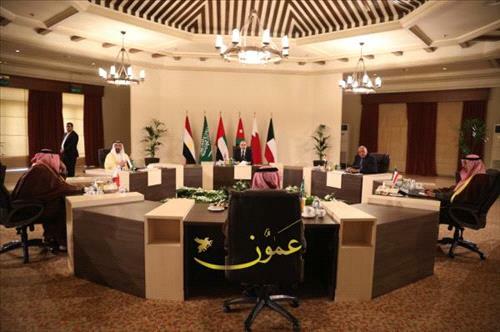 During the meeting, at Al Husseiniya Palace, the King highlighted the need of joint coordination on regional issues and crises aiming to boost joint Arab action and serve the interests of Arab countries and peoples, expressing hope that Thursday's meeting will yield successful results. Later today, Foreign Minister, Ayman Safadi, will hold a press conference to talk about the meeting.